The perfect pairing for her Lavender Mint shampoo. Although I don’t find I need to use conditioner on my long hair, I love putting a little bit through the ends. Rosemary and mint essential oils, will awaken even the sleepiest mornings. “This conditioning formula is pH balanced and will help smooth the cuticle of hair and prevent damage, leaving hari incredibly soft and full. The combination of botanicals and oat protein help hair retain moisture, with the essential oils of rosemary and mint strengthening hair, enhancing hair growth and thickening hair. Small Batch. Hand-Foraged. Plant-based. Ethical. 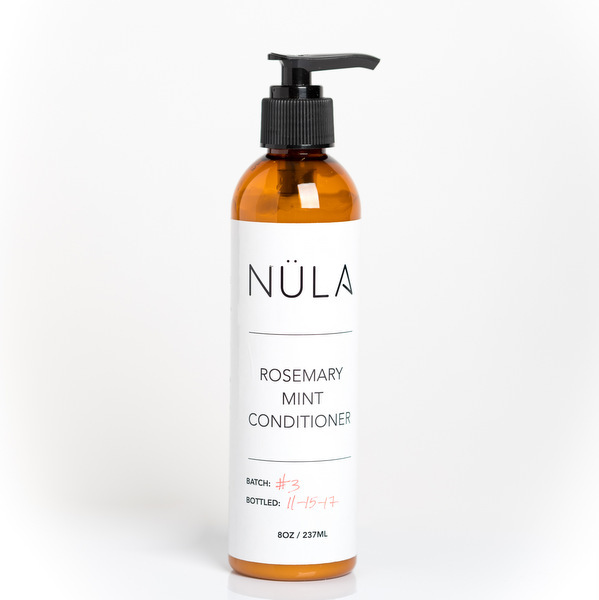 NÜLA skin care products are free from harsh and toxic chemicals such as parabens, phthalates, sulphates, artificial colours, and synthetic fragrances. 100% cruelty free. Apply a few pumps of conditioner to ends of hair and comb through. You can rinse immediately, or leave on hair for a few minutes for extra hydration. Distilled water, Extracts of Rosemary, Lavender, Rose, Nettle and Lemon Grass, Hydrolyzed Oat Protein, Glycerin, Emulsifier from Colza Oil (Behentrimonium Methosulfate & Cetearyl Alcohol), PB Microcide (Polyaminopropyl biguanide), Pro B vitamins (dl Panthenol), Essential oils of rosemary and peppermint.